The recently launched website whocanihire.com puts small and medium size businesses right in front of their target market using social media to promote at little or no cost. Businesses and professionals can create a unique profile up to five pages with company logo, links to current website and many of the social media networks like twitter, yelp, facebook and LinkedIn. whocanihire.com went through great effort to develop a clean, user friendly site to be utilized by both small business and consumer. The site feature few banner ads and does not accept pop-up advertising. "I was recently introduced to a new website called whocanihire.com and I'm convinced this site could change forever the way small business owners promote their companies on the Internet" said Patrick Gostley of TodaysBusiness.com. Businesses and professionals listed within whocanihire.com can actively interact in real time with their customer base. 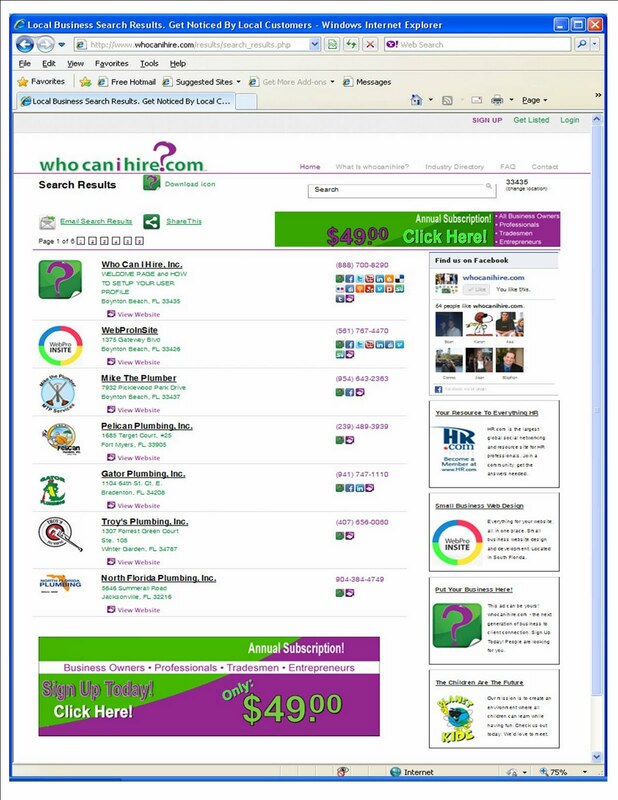 An example of a typical "Search Results" page resulting from a search for "plumbing" within the whocanihire.com database.